Thoughts and reflections on connecting, co-learning, and collaborating in a beautiful and complex world. Thanks to Maureen Crawford for sharing her first post on 10 things worth sharing with me last week. Her format using the simple idea of ‘things worth sharing’ seemed like something I could do on a regular basis. To date, this was the easiest (or least time consuming) blog post for me to put together. Some of this week’s ideas led to this insight of being able to share information more quickly or more simply. Other ideas are focused around digital workplace and leadership skills. 1) How do we explain the learning that goes on by sharing micro-content? In Kate Pinner’s Sunday Summary, she shared this link on micro-learning. I liked the term micro-learning because it places the emphasis on what people will takeaway or learn from your micro-content. 3) I could do this! A 30 second lifelong habit. Through Maureen Crawford’s 10 things worth sharing post, I found this idea could build off the idea of blurting for blogging. Taking 30 seconds to jot down a note after a meeting or experience is a great way to keep track of what I’m learning. I can just grab these 30 second insights from my daily Evernote entries or from a sketch note I’ve created, then place them in a weekly blog post summary (like I have here today). 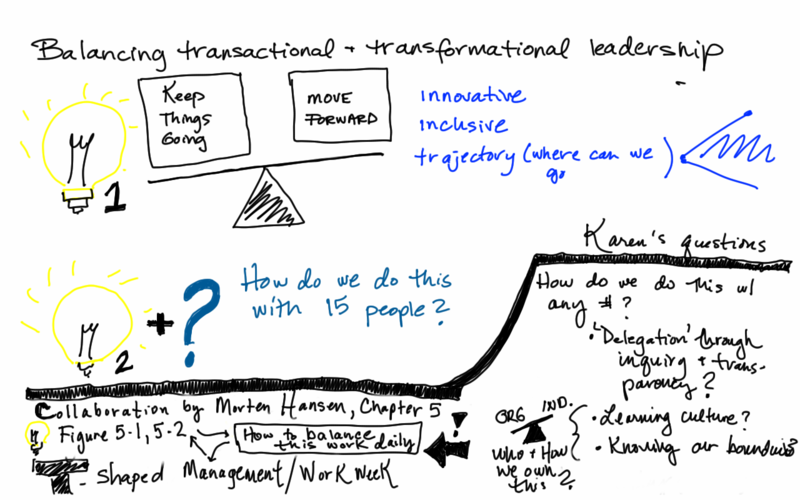 4) Transactional, Transformational, or T-shaped leadership? My colleague Anne Adrian summarized a professional development activity on Full Range Leadership during a recent meeting. It was about balancing transactional leadership with transformational leadership. In an effort to capture this discussion, I sketched it. This reminded me of when I first read about T-shaped leadership in Morten Hansen’s book Collaboration. It’s been a few years since I read Collaboration, but I realized it might be good to think about it again. Planning a T-shaped workweek (as described in this HBR article) could be thought of a daily activity as part of one’s PKM (personal knowledge management) routine, and as a way to shape and grow one’s personal learning network. 5) What are the Required Skills for Today’s Digital Workforce? Dion Hinchcliffe’s insightful post includes two graphics: one on internal and external digital factors that affect change, and another defining seven skills for the digital workforce. I thought both of these graphics could be helpful for finding a starting point to direct change initiatives within organizations (or personally). This post created a flurry of other insights, blog posts, and conversations about which digital work force skills and mindsets are required in today’s digital and networked world. I plan to expand more on this in an upcoming post. This entry was posted in Reflection Point and tagged thingsworthsharing by kjeannette. Bookmark the permalink. Thanks, Kate! I’ve admired how you have routinely stuck to your Sunday Summary. I can see its value as you share things throughout the week. It’s definitely pushed me to find a way to share more simply. I routinely think about your ‘getting over yourself‘ comment. I don’t know if I suffer from perfectionist tendencies or perhaps it’s just that blogging is more of an art form than I had imagined. My degrees are in the sciences. I wrote few papers (or not enough) that used metaphors, quotations, or told stories, so this is definitely new territory for me to share more simply, artfully, and on a personal level. Hey Karen, great idea and good way to both reflect, log and share your learning progressively. Like you (as you know!) I have the same struggles with blogging and doing so regularly. Part of it is the time / habit factor, part is learning the art/skill of sharing half baked/ evolving thinking. This seems like a good starting point. Thanks for the idea – and I love the inclusion of the drawing – something else I want to start doing more of too! Thanks, Tanya. You do such a great job of commenting on blogs. In fact, I’ve seen how valuable commenting on blogs can be for sensemaking by observing your blog comment contributions. I’d be very interested in seeing a quick summary of the blog posts you’ve commented on and why you found them helpful to read or comment. I wonder if that might be another quick way to share ‘evolving thinking’ via a blog on a more frequent basis? Reverse commenting is a missing feature of blogging I found. A quick fix consist in using a curation platform but then is the author who is depossed from the convo going on. What I do is that I copy all my comments before saving (serves as backup also) and keep track of where it was. I think that doing weekly roundup of commented blogs could be a good idea. This is an inspiring post for me. So happy to read from someone who is not posting day after day seemingly effortless. Inspiring also because my goal is to serve people like you, so I can see the needs, what we could do, help, imagined. It’s not all about technology of course but has Dion mentionned technology has roles to play in the changes we experienced. Causal role, enabling role, friction role. I see this post as a curation of ideas. thoughts, bookmarks of readings that have ongoing potential of helping us uncover more ideas. This idea of micro content leading to micro learning has been in my head all day. I read yesterday about lean content, then about intelligent content. Wrong tracks. I think there is something halfway between tweets and long form posts perfectly adapted to transfer tons of knowledge. Real time, digestible, easy to write, to consume, possibly half baked. I see your post as a prototype of it. Strange enough there are more comments and engagement on occasional bloggers than on serial bloggers. IMHO The future is in short posts and conversations, not in long academic essays trying to build yet another piece of contents on an over burned idea. I’m going to follow you on this direction. Karen – this is brilliant! I really like the way you chose to frame your sharing by posing a questions and then gave the issue context with your annotations. I am thinking that maybe I am falling into a bit of Collector’s Fallacy with my posts of 10 things worth sharing – perhaps in my next blog I will spin of your inspiring post here and pull back to 5 with more in the way of commentary. I love the conversation and ideas drawn from each other. Thanks for the shout out. Maybe Bruno, Tanya, you and I will figure out a way to co-produce something! Thanks for raising these points Tanya, Bruno and Maureen. All this co-learning is amazingly insightful 🙂 I half stumbled upon this because it felt right (I’ve been wanted to do a better job of working from conversations and asking better questions) and because I didn’t want to commit to something I couldn’t keep up with on a routine basis. I’ve struggled with how to ask questions, and somehow Maureen’s post shed some light on how I could share short insights and ask questions at the same time (thanks again, Maureen). Tanya’s thought of sharing half-baked ideas as sharing ‘evolving thinking’ has been on my mind lately. It seems as though we are co-evolving in our thinking. Something like this might work for a few of us, and in each iteration as we share it it could get better and more interesting. Along these lines, and in response to the Collector’s Fallacy article Bruno shared (http://christiantietze.de/posts/2014/01/collectors-fallacy/) I’ve been very intrigued at how important the collecting, sorting, and pre sensemaking part is to support PKM and PLNs. Visually, I see there is a sweet spot here (screenshot)> https://www.evernote.com/shard/s37/sh/ee390f07-d3ad-4664-a242-739c75f6e196/12c00a1a770769719e56ec9ed3462840. It sounds like you have an idea that a blog post should aggregate enough content to be as long as this one. I am much more likely to read shorter blog posts (1-3 paragraphs); this length takes me a while to get around to.